The Super Bowl Saturday event garnered a live gate of $2,389,975. Of the 9,015 folks in attendance, the NSAC reports 6,727 fans paid to enter the arena, while an astonishing 2,288 people received complimentary tickets. There were 751 unsold seats. The official numbers don’t deviate too far from what UFC president Dana White reported during the UFC 143 post-fight press conference. White said 10,040 fans had packed the venue, generating $2.3 million at the door. 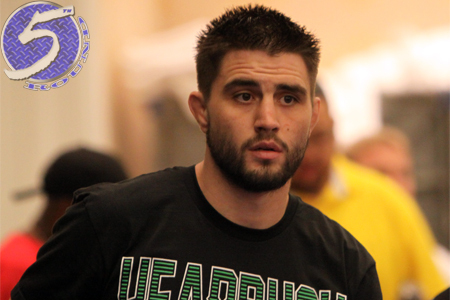 The pay-per-view’s featured attraction showcased an interim welterweight championship affair between Carlos Condit (Pictured) and Nick Diaz. When the dust settled on their 25-minute battle, Condit left Las Vegas with a highly-controversial unanimous decision victory and the 170-pound hardware. Diaz subsequently failed his drug test after screening positive for marijuana.